This ticket allows you to access to all 3 days of Bilbao BBK Live 2019. This ticket allows you to access Bilbao BBK 2019 on the 11th of July. This ticket allows you to access Bilbao BBK 2019 on the 12th of July. This ticket allows you to access Bilbao BBK 2019 on the 13th of July. 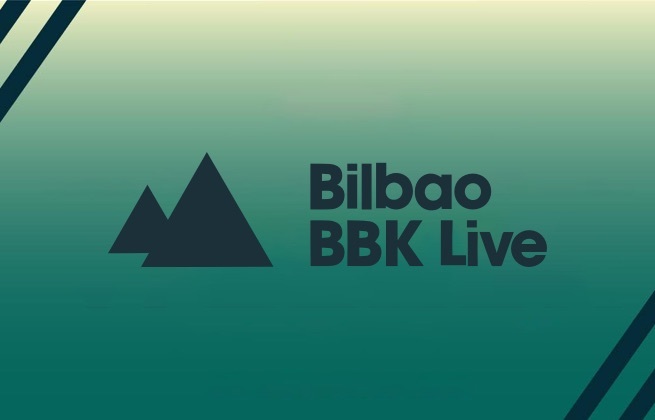 This ticket allows you to access Bilbao BBK Live 2019 with camping included. 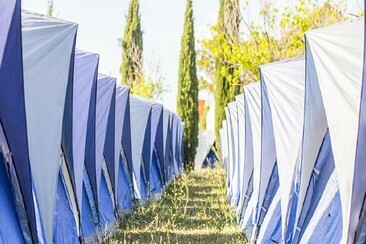 The Glamping Company offers you already pitched tents, for two or four people in the Glamping Area inside the festival, where you can accommodate and enjoy in complete comfort your favourite event. 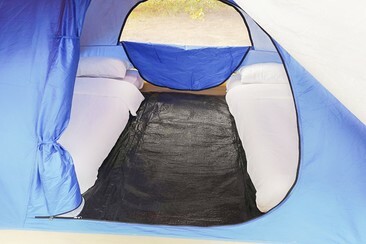 No need to carry and pitch the tent, and no fights for a piece of ground in acceptable conditions. We have everything ready for you, you only need to have fun when you arrive! 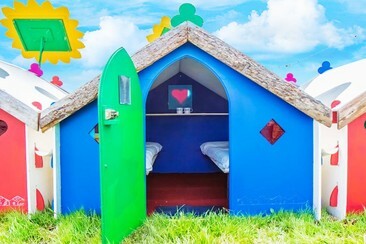 Welcome to the world of Podpadding, which offers a range of quirky alternative accommodation options catering to different budgets, levels of luxury and group sizes. Choose from the range of delightfully pretty Podpads, Luxpads and Bunkpad houses with solid floors, walls and lockable doors, or brightly coloured strong spacious canvas Bellepads, or opt for Octopads which combine the best of both worlds. Standard versions include beds, fitted sheets, coat hooks, hanging storage, mirrors, and lights, with options to add bedding and seating packages. Upgrade to the luxury versions to include duvets, pillows, bed throws, scatter cushions, bath and hand towels, rug, camping chairs, camping table, and camping lanterns. All options are pre-pitched ready for your arrival in a bespoke area with wristbanded access, 24-hour security, free phone charging facilities, free tea, and coffee at specified times, and decent toilets and showers. 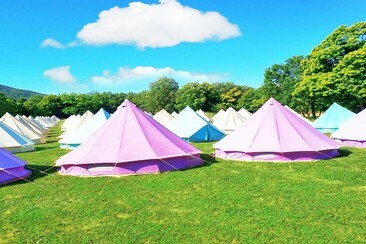 If you want to go to a festival but don't feel like carrying and pitching a tent, the Glamping Co. fully equipped Bell Tent is your premium accommodation solution. With added services as breakfast buffet (depending on the agreement with each event), courtesy/welcome drink and its fully equipped beds to make your stay an exceptional experience. Festival Tickets are not included in your accommodation price, and must be booked separately. - Double or individual cabin, installed inside a container with central power & air conditioning systems. - Terrace, one of the sides of the container is folding to the floor to became a terrace with tables and banks and sunshades for summer use, for winter use it applies closed common area with fireplace. - Isolated container to keep a good habitability inside the capsule. The container must be plugged to a power supply. - LED intelligent sliding central control, Temperature display, calendar function, Reading lamp, Backlight headlight, Ceiling light - LED backlight display, Sci-tech ceiling, Hollowed out dreamlike ceiling (double ceiling). - Toughened glass leaning plate, Electronic safety box, Powder fire extinguisher, Ultra sensitive smoke alarm, Deluxe waterproof dressing mirror. - Ajustable air conditioning cycle system, New air ventilation (M3/h): 30, Advanced bedplate (flame retardancy, bug prevention, anti mildew), Ergonomic skidproof staircase. Only 5 minutes by metro from the city centre, BBK Bilbao Good Hostel is the first hostel managed by people with disabilities in Bilbao. This welcoming bed & breakfast hostel offers free wi-fi across the whole building, a secure bike parking, private car parking and 3 terraces to enjoy the nice weather. A shared fully-equipped kitchen and common areas are at your disposal to cook, relax and meet people. 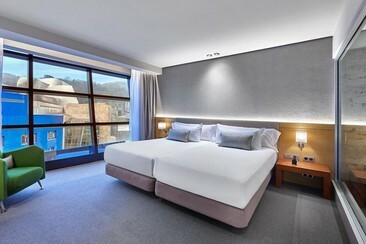 The 4-star Hotel Abando is located in the centre of Bilbao only steps away from the world-famous Guggenheim Museum, the Fine Arts Museum, the modern Alhóndiga, the Old Town and the Ensanche Quarter. Constructed in 1991 and recently renovated with a modern façade, the Hotel Abando represents a midpoint between tradition and the avant-garde. The hotel features 141 spacious rooms with stylish décor, a gift shop, internet terminals, a library with books in several languages, and a free gym with sauna and a Turkish bath. An extensive and varied buffet breakfast is served by the hotel each day, and the Epaia Restaurant offers an elaborate selection of dishes that combine traditional Basque cuisine with the latest trends as well as an extensive wine list. The Platea 9 Café is a unique space for a midday apéritif or an evening beer, the café also has a TV showing football and pelota matches. 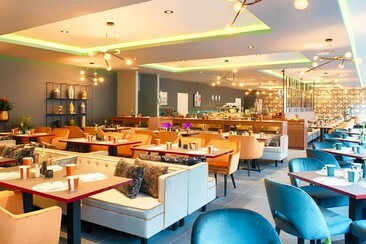 An extensive and varied buffet breakfast is served by the hotel each day. 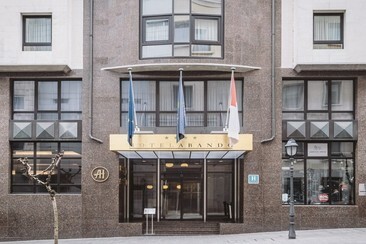 Hotel Abando is ideally located with easy access to Bilbao's main thoroughfares and is also within easy walking distance of attractions including: the Albia Gardens, the Arriaga Theatre, and the Bilbao Town Hall. The La Paloma International Airport is 15 minutes away, and the Abando Train Station is only 200m from the hotel. The Hotel Carlton is the most emblematic and luxurious hotel in the city of Bilbao. It has 6 floors and 141 spacious rooms. There you can enjoy facilities such as the spectacular Salón La Cristalera, where you can have a snack or enjoy a book, the gym with its steam room and the business centre. You will also find the Restaurant Carlton, where you can enjoy Basque cuisine and the Bar El Grill with its famous tapas and varied cocktails. 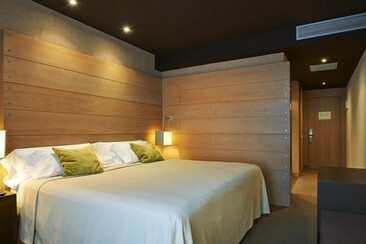 Located in the centre of Bilbao, this modern hotel is close to restaurants and trendy shops in town. This 4-star hotel offers a fitness centre with city views and 325 guest rooms equipped with air-conditioning, minibar, safety boxes, and free Wi-Fi access. The hotel’s modern Bermeo Restaurant serves a mix of traditional Basque food and modern international dishes where guests can enjoy breakfast, lunch, and dinner. Dry and Cool Ercilla Cocktail Bar, open until 06:00 offers live music and theme parties while The Le Club Lounge set on the rooftop offers panoramic views of the city. A metro station just across the road from the hotel connects to the beach within 20 minutes. Vincci Consulado de Bilbao is a new hotel in Bilbao that takes the form of a sailboat appearing to ride across the Estuary of Bilbao. With its visionary nautical design, Vincci Consulado de Bilbao is the best way to discover everything Bilbao offers. Popular points of interest nearby include Bilbao Fine Arts Museum, Guggenheim Museum Bilbao and Casco Viejo. Attractions in the area include Arriaga Theatre, 1.7 km away, or Funicular de Artxanda, set 1.9 km from the property. San Mamés Stadium is 2.1 km from the hotel. Bilbao Airport is 13 km away. At the hotel, the rooms have a desk, air conditioning and a flat-screen TV. The private bathroom is fitted with a bidet and free toiletries. These bright and spacious rooms offer excellent services and exquisite décor made from natural elements such as wood, encasing them in a warm and inviting atmosphere. The Hotel Miró has an incredible location, between the Guggenheim Museum and the Museum of Fine Arts. The hotel offers spectacular views from a unique architectural setting. Also situated only a few metres away from the shopping area of the city. The hotel has a magnificent collection of contemporary photography to admire and the Courtesy Bar where hotel guests can freely enjoy a drink and relax or work. The Wellness Suite offers different types of massage to take the stress away. Breakfast is offered every morning with in season local products. Public parking is possible at a location nearby (reservation is not needed) and charges are applicable. With its multi-colored windows, the NH Collection Ría de Bilbao hotel, formerly known as Hesperia Bilbao, makes a striking contribution to Bilbao's riverfront. It enjoys a prime position right opposite the Guggenheim Museum and 5 minutes' walk from the shopping and business districts. Plus the airport is just 15 minutes away by car. 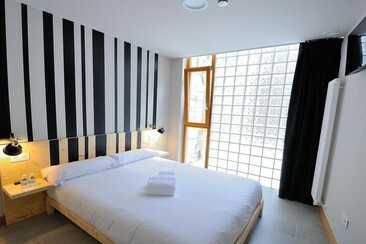 The hotel offers 151 bright and modern rooms with all the comfort needed and free wifi. La Ría Restaurant serves an enticing selection of modern Basque dishes. For sushi, cocktails and live music, the La Orilla bar is there and comes with views across the river. An indoor parking is available. 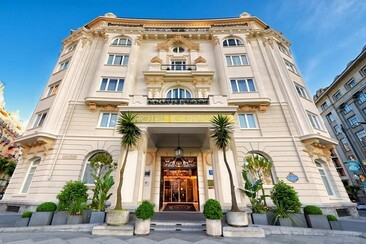 The NH Collection Villa de Bilbao hotel is located in the heart of the city, an easy walk from the Guggenheim Museum and footsteps from the Congress Palace. The building is stylish and modern and was completely renovated in 2012. There are plenty of first-class bars and restaurants on the doorstep too. 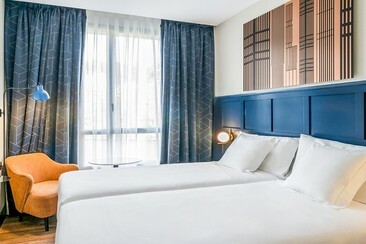 NYX Hotel Bilbao by Leonardo Hotels is located in Bilbao, 100 m from Arriaga Theatre. Around 1.3 km from Funicular de Artxanda, the property is also close to Catedral de Santiago. Local points of interest like Bilbao Fine Arts Museum and Euskalduna Conference Centre and Concert Hall are reachable within 1.6 km and 1.8 km, respectively. Guggenheim Museum Bilbao is 1.9 km from this hotel, while San Mamés Stadium is 3.2 km from the property. The nearest airport is Bilbao Airport, 13 km from the accommodation. 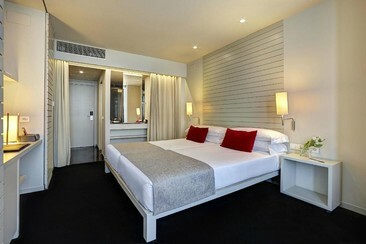 All 109 rooms provide conveniences like sofa beds and sitting areas, plus free WiFi and LED TVs with satellite channels. Other amenities available to guests include minibars, room service, and coffee makers. Designed by Javier Mariscal, this stylish hotel is located opposite Bilbao's Guggenheim Museum. It features a roof terrace with a restaurant and spectacular views. 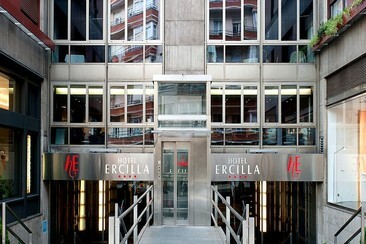 Designed by Javier Mariscal, this stylish hotel is located opposite Bilbao's Guggenheim Museum. It features a roof terrace with a restaurant and spectacular views. The Museum of Fine Arts and the Maritime Museum are both within 500 meters of the hotel. 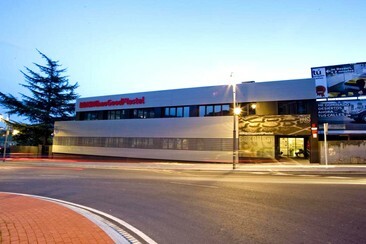 The city’s shopping area, including the Zubiarte Shopping Centre, is a 5-minute walk away. Get to the festival in comfort and on time! This service is provided by Flixbus. On board the bus you will find free Wi-Fi, extra legroom, low-cost snacks and drinks, numerous plug sockets, toilets and a lot of room for your baggage. Please note: Coaches may be cancelled up to 14 days prior to travel due to insufficient numbers. Return back Biarritz from the festival in comfort and on time! This service is provided by Flixbus and thus are subject to the T&Cs of Flixbus. On board the bus you will find free Wi-Fi, extra legroom, low-cost snacks and drinks, numerous plug sockets, toilets and a lot of room for your baggage. Please note: Coaches may be cancelled up to 14 days prior to travel due to insufficient numbers. Return back Bayonne from the festival in comfort and on time! This service is provided by Flixbus and thus are subject to the T&Cs of Flixbus. On board the bus you will find free Wi-Fi, extra legroom, low-cost snacks and drinks, numerous plug sockets, toilets and a lot of room for your baggage. Please note: Coaches may be cancelled up to 14 days prior to travel due to insufficient numbers. Return back Bordeaux from the festival in comfort and on time! This service is provided by Flixbus and thus are subject to the T&Cs of Flixbus. On board the bus you will find free Wi-Fi, extra legroom, low-cost snacks and drinks, numerous plug sockets, toilets and a lot of room for your baggage. Please note: Coaches may be cancelled up to 14 days prior to travel due to insufficient numbers. Return back Toulouse from the festival in comfort and on time! This service is provided by Flixbus and thus are subject to the T&Cs of Flixbus. On board the bus you will find free Wi-Fi, extra legroom, low-cost snacks and drinks, numerous plug sockets, toilets and a lot of room for your baggage. Please note: Coaches may be cancelled up to 14 days prior to travel due to insufficient numbers. Return back Porto from the festival in comfort and on time! This service is provided by Flixbus and thus are subject to the T&Cs of Flixbus. On board the bus you will find free Wi-Fi, extra legroom, low-cost snacks and drinks, numerous plug sockets, toilets and a lot of room for your baggage. Please note: Coaches may be cancelled up to 14 days prior to travel due to insufficient numbers. A return coach from Birmingham, operated by Big Green Coach. All travel services include all return coach and ferry travel direct to the main wristband exchange at Bilbao BBK Live. There will be a Big Green Coach representative on the coach at all times. A return coach from Dover, operated by Big Green Coach. All travel services include all return coach and ferry travel direct to the main wristband exchange at Bilbao BBK Live. There will be a Big Green Coach representative on the coach at all times. A return coach from London, operated by Big Green Coach. All travel services include all return coach and ferry travel direct to the main wristband exchange at Bilbao BBK Live. There will be a Big Green Coach representative on the coach at all times. A return coach from Manchester, operated by Big Green Coach. All travel services include all return coach and ferry travel direct to the main wristband exchange at Bilbao BBK Live. There will be a Big Green Coach representative on the coach at all times. The best of basque cuisine in your hand. Taste the Pintxos of the moment in the best bars of the city. Start by meeting in the Arriaga Plaza and wander through the seven streets of the old town. Visit the Plaza Nueva, the Santiago cathedral and then visit two or three different bars to experience the pintxos and drinks Basque style. Experience the best of the Basque Cuisine! No more ringing in your ears! Earplugs with special music filters. The Alpine PartyPlug, protects your hearing, whilst the music quality remains very good. Please note: The Alpine PartyPlug is supplied by Alpine Hearing and will be shipped to the address provided upon booking before the start of the festival. Earplugs will be dispatched the week after purchase. There are some countries to which the purchase might not be delivered. Protect your hearing whilst the music quality remains very good! Bilbao BBK Live is one of Europe's best-loved music festivals, taking place each summer in the northern Spanish city. Musically diverse, the lineup is comprised of alternative favourites and indie superstars alongside figures from the worlds of pop, hip-hop and electronic music. A huge part of the festival's appeal is its setting, in the beautiful mountains that overlook the city of Bilbao, complete with lush greenery and enchanting woodland. And the festival really makes the most of this, with stages hidden amongst the trees and a pervasive atmosphere of magical escapism and inclusivity. The festival takes place in the greenery of Mount Cobetas, overlooking the city of Bilbao on Spain's northern coast.